Happy Hump Day! It is amazing how it is already Wednesday during a 4 day work week! Can we do this every week? Well we are halfway through the short week so that means it is time for an arm workout. Following the all abs and leg workout, it was time for the all arm workout. The workout incorporates chest, triceps, biceps and shoulder exercises to get those arm muscles blazin, ready for tank tops this summer! For this workout: All you need is a set of weights and a bench, chair or step. Complete 15 reps of each exercise. Follow each round with 3 minutes of high intensity cardio. Examples? Jumping Jacks, Burpees, Mountain Climbers, Sprints, Star Jumps, Jump Squats, Jumping Rope. After you have completed one round, repeat each round for a total of 3 times. Good luck- Light those arm muscles on fire! 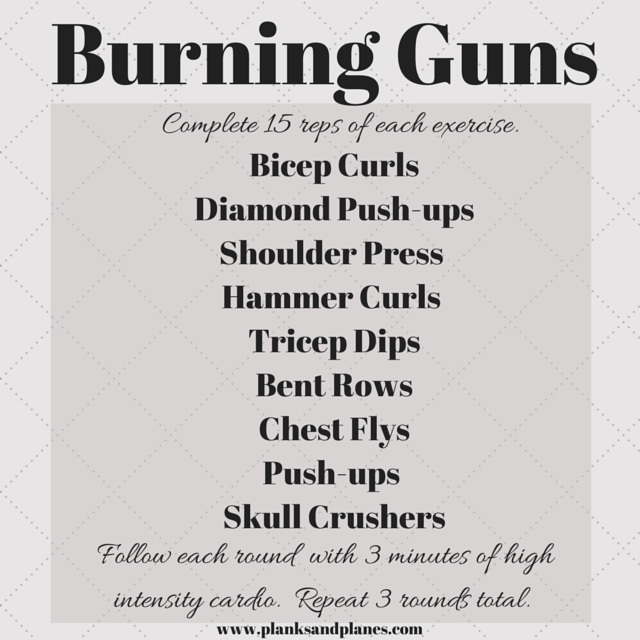 This entry was posted in Arm Workout, Fitness, Group Fitness, Workout and tagged Arm Workout, Fitness, Group Fitness, Workout. Bookmark the permalink.